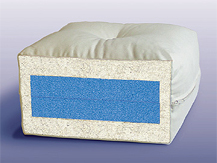 The plushcor has as its characteristic feel a slow release foam that allows the body to gently sink into the futon. If you like extra firm, firm or even medium firm this is not the futon mattress for you. This is for the person that wants a plush feel to their sitting furniture. The core of this futon is four inches of solid medium density foam wrapped with poly-dacron fibers and cotton batting on each side.. This blend fills out the depth and adds softness to the surface. You have to try this one to realize the depth of the plush comfort it offers. Everybody has their own preference for comfort and their own liking. This is one of our best sellers.